The opportunity of making money online attracts hundreds of people worldwide. Inspired by the success of many, they become e-retailers by creating their online stores on different e-Commerce platforms. As sales start growing, they still lose about 60% of them due to shopping cart abandonment. Shopping cart abandonment happens when a merchant’s potential customer leaves their order uncompleted because of certain reasons. Among them are not just trivial searches unintended to make a purchase, but also such problems as a better price found elsewhere, webpage lagging / crashing / timing out, a complicated process of placing an order, and even unsuitable delivery options. The good news for online vendors is that a great percentage of the carts that did not become their profit still can be saved. With the help of your business, of course. The industry boom indicates that demand for abandoned carts recovery is not going to decline. This is where e-merchants’ losses can become a profitable opportunity for your company growth. The biggest and thorniest problem service providers will face here is integration with shopping carts, as each separate one is a long and painful process in terms of money and resources. Moreover, the result -- a ready integration -- will need even further technical maintenance that is no cheap. API2Cart is what can lend such companies a hand. It reduces the lasting and costly inconveniences up to nothing. You integrate once and get access to the database of 30+ leading e-Commerce platforms, which makes up to 80% of the whole digital market, instead of merely one. Once connected, you can retrieve, manipulate and use data not on abandoned carts only, but also customers, products, prices, orders, categories, etc. See the whole list of methods in the table or have a more technical look in the documentation. 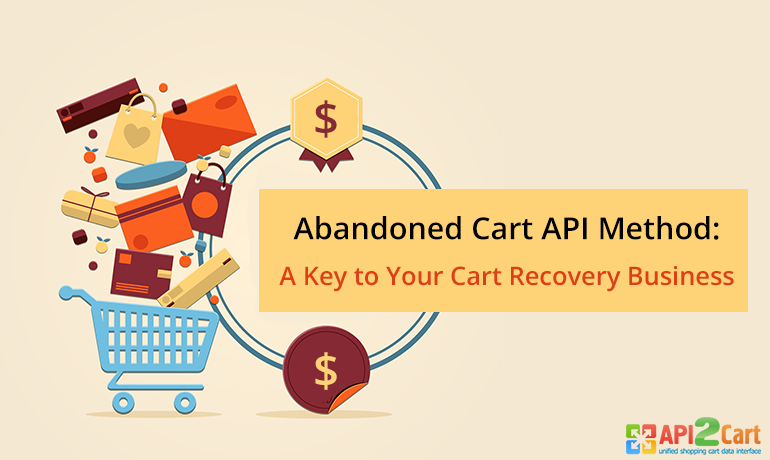 Order.abandoned.list API method is yet supported for Magento, Shopify, OpenCart, and WooCommerce. CS-Cart, X-Cart, PrestaShop, and osCommerce are currently in the process of development. If you would like to schedule a FREE consultation with our expert to talk about abandoned cart opportunities for your business, do not hesitate to do so by clicking the button below.